I mentioned earlier that corporate cash has been piling up since 1982. The number that is being bandied about (via the Fed) is that the 500 largest non-financial firms have $1.8 trillions dollars in cash. I wasn’t sure how the Fed came up with their number, and I wanted to look at the data in greater detail. So enlisting our staff to help, we decided to do the math ourselves. On our Bloomberg terminal, we pulled up all of the “Cash & Equivalents.” Then, we eliminated 1) all banks stocks; 2) all financial firms. We wanted to show only corporate cash, and not client accounts. What this generated was a somewhat different set of numbers than those of the Fed (See excel spreadsheet below). We found that 3,000 non-financial firms have $1.641 trillion dollars in cash and equivalents. -The top 50 firms are over half of this dollar amount, accounting for $823.642 billion dollars. 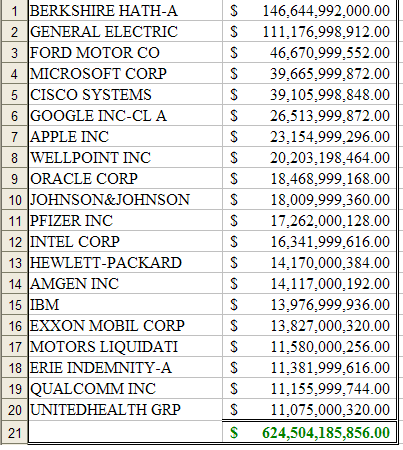 -The top 20 firms, ranging from Berkshire to United Health Group account for most of this — $635.386 billion dollars. -The automakers are another anomaly — Ford (at #3) is showing $46.67 billion dollars in cash — but its against $66.668 billion in liabilities. Even GM’s bankrupt stub Liquidation Motors (# 17) is showing $14.194 billion in cash against $73.934 billion in debt. -I’m not sure if we should exclude Berkshire Hathaway or GE as financials, but they accounted for $146.644 and $111.176 billion dollars respectively. Lastly, this data only includes publicly traded companies, and excludes private or closely held firm. It also excludes private equity firms, VCs, and hedge funds (public or private). Jim Bianco reports corporate cash is 7.3% — exactly what the historical median has been.